We headed to the Dastkar Design Fair to find awesome and boy did we find lots of awesome! Barely half an hour into our sojourn, we stumbled upon this beautiful jewellery stall which had the most gorgeous nose-pins! Definitely something to add to your nose-pin collection. 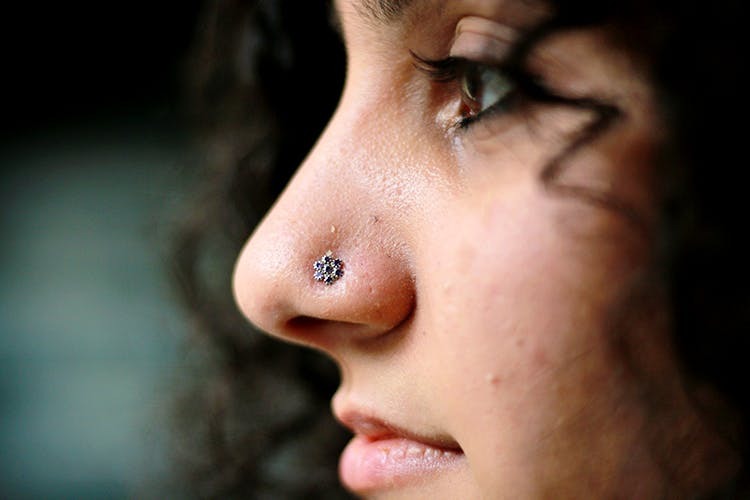 You can definitely up your nose-pin collection with her affordable collection. They have pins varying from semi-precious stone designs to oxidised silver studs. Some are also big enough to cover your nose and make you look classy and ethnic at the same time. The price starts from INR 350 and goes up to INR 600 for the pins. We didn’t stop exploring there. They also have a beautiful jhumar collection. When we say beautiful it’s not your run of the mill traditionally designed jhumars. They’re actually very unique and are made mostly of beads, metal, semi-precious gems and silver of course. We weren’t so crazy about the earrings but the rings were definitely worth a look. Check their stuff out here. Start booking your orders now. They work out of Gurgaon and partake in most of the jewellery exhibitions in the city. You can call them directly and place your order.